Our pledge excellent products- Our promise Customer Satisfaction!!! SPEAK TO A LIVE PERSON NOW! 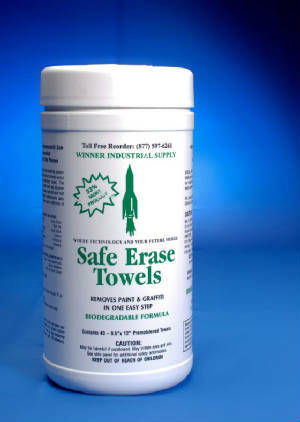 When effectiveness is important but safety is a must, use only SAFE ERASE GRAFFITI TOWELS!! EXCELLENT ONE STEP GRAFFITI REMOVER FOR NON POROUS SURFACES. ABRASIVE TOWELS. BIODEGRADABLE,ODORLESS , ENVIRONMENTALLY FRIENDLY, AND NON TOXIC. EXCELLENT FOR:SCHOOLS, RESTAURANTS, PARKS, POST OFFICES ,HOSPITALS ETC. DESIGNED SPECIFICALLY FOR AREAS WHERE EFFECTIVE IS NECESSARY BUT WHERE SENSITIVITY TO SAFETY OF THE ENVIRONMENT AND APPLICATORS IS A MUST! EACH CASE CONTAINS 2 BOXES WITH 6 CANISTERS IN EACH BOX (TOTAL 12 CANISTERS). WILL NOT HARM LEXAN AND MOST PLASTIC SURFACES. 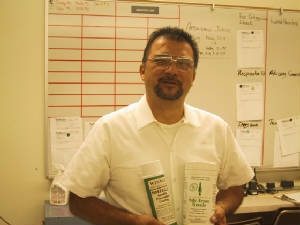 THIS PAINT SHOP SUPERVISOR FOR A LARGE CALIFORNIA SCHOOL DISTRICT SAYS" WITH THE COMBINATION OF SAFE ERASE GRAFFITI TOWELS AND SHIELD ANTI-GRAFFITI COATING HE HAS SEEN A MARKED DIFFERENCE IN LABOR INVOLVED IN GRAFFITI ABATEMENT. HE HAS IN THE PAST RECOMMENDED THESE PRODUCTS TO OTHER GRAFFITI ABATEMENT TEAMS AND SAYS HE WILL GLADLY CONSULT WITH ANYONE WHO HAS QUESTIONS CONCERNING APPLICATON OR RESULTS IN THE FUTURE. FREE SAMPLES ON ALL PRODUCTS! This Paint shop Supervisor at a major University in Nevada says he likes the Safe Erase Towels because the product seems like it is doing the work rather than he and his crew!! 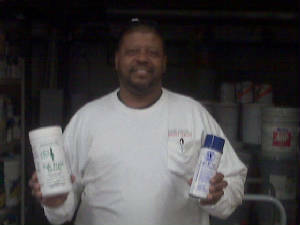 WE ASKED THIS GRAFFITI ABATEMENT SUPERVISOR FROM PUBLIC WORKS WHY HIS CITY CHOSE SAFE ERASE TOWELS. HE SAID ,"IT WORKS FAST,THERES NO SMELL AND WE DON'T HAVE TO WORRY ABOUT THE WIND BLOWING IT IN OUR FACE. Contains 40 – 9.5”x 12” Premoistened Towels IN A CANISTER. SPEAK TO LIVE PERSON NOW!